Ian Kirkpatrick is a Canadian-born artist who moved to the UK in 2008 where he began his graphic design and contemporary art career. His works have been featured on an international scale from New York to Berlin galleries. Unlike artists who often choose a single, or maybe even a few mediums to work with, Kirkpatrick utilizes a wide array of materials from corrugated cardboard to stainless steel. He works mostly in a digital format, enabling his works to be manipulated from small to large scale easily. 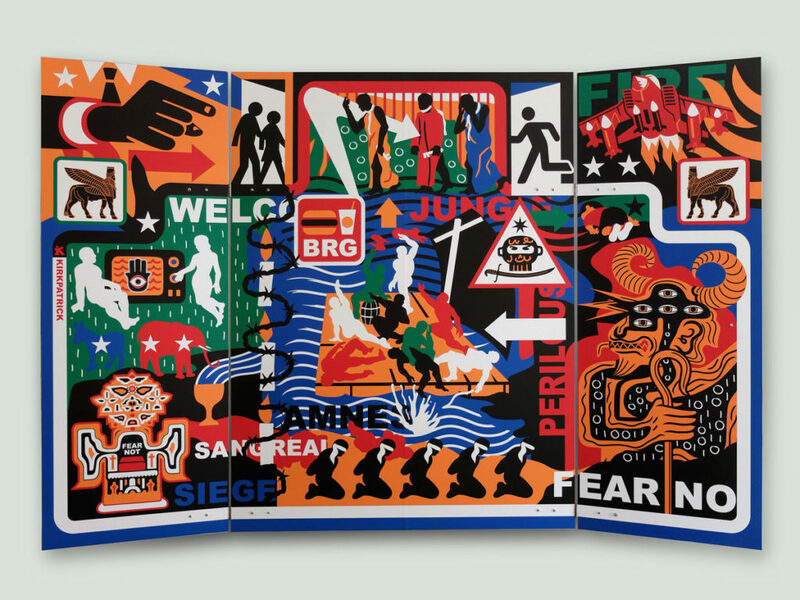 Some of his most recognizable pieces feature direct digital prints onto cardboard. These large-scale works are captivating, employing a unique selection of colors and iconology that is anticipated and symbolic of his works. In his most recent exhibit, Renaissance, he explores the capabilities of Dibond aluminum composite panels. First using Dibond back in 2010, Kirkpatrick was initially drawn to the material when he discovered its use in street signage. In 2016, he created a contemporary altarpiece as a response to the refugee crisis for a local church. 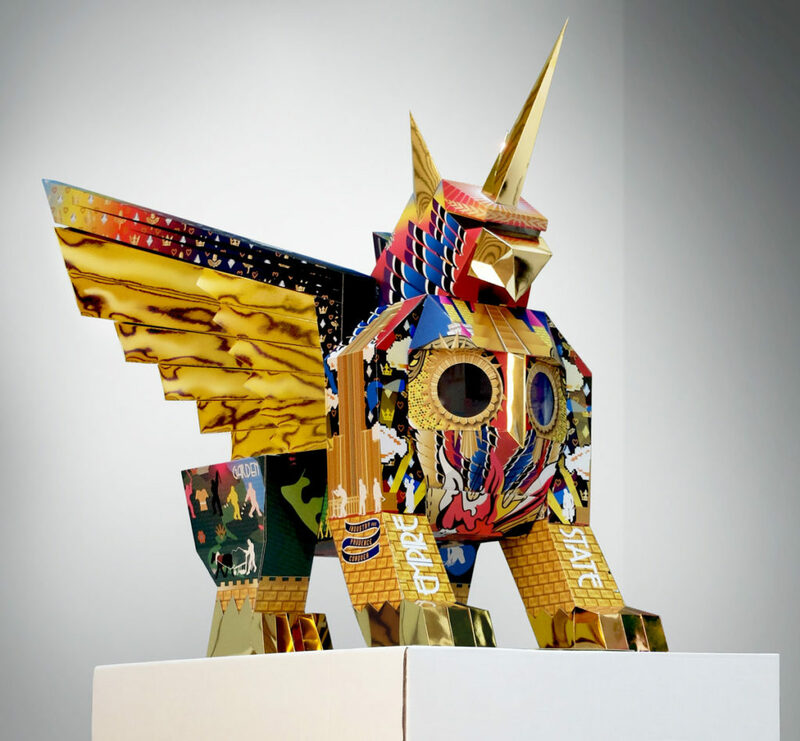 The piece again features colorful and contemporary symbolism utilizing his own unique iconography. 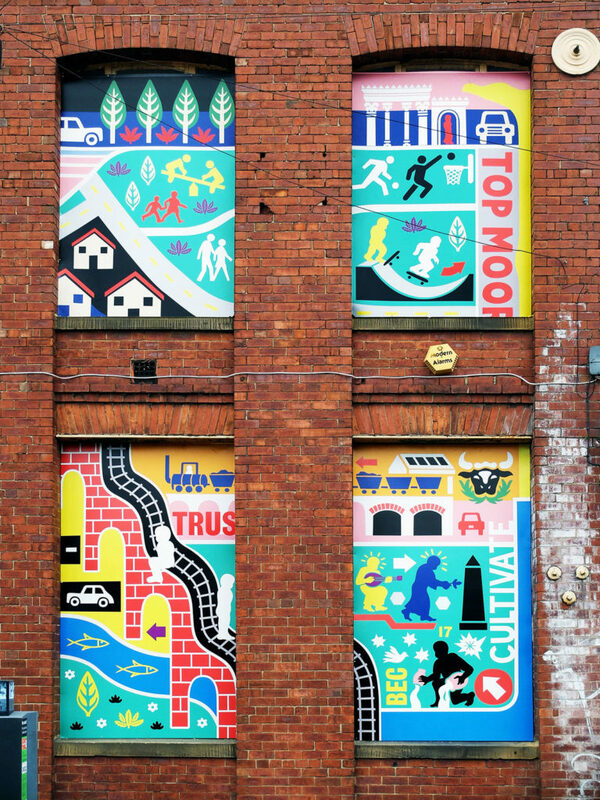 Leeds City Council commissioned the Renaissance mural and is responsible for a large development of the Leeds South Bank area. This underused industrialized area will receive a well-needed rejuvenation. Kirkpatrick was chosen to revitalize a previously neglected historical building. Kirkpatrick did research before choosing a composition for his piece. Exploring the past, current events and future of the building site. 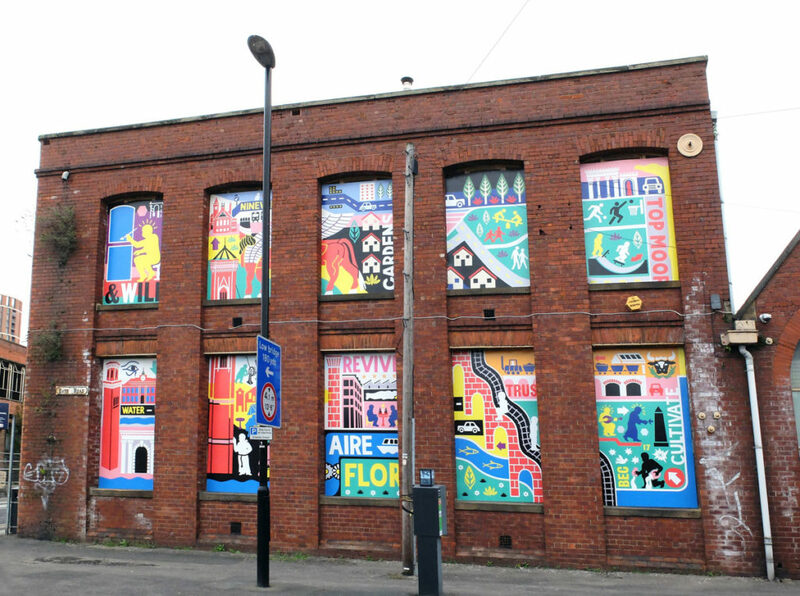 In his research he discovered that the abandoned buildings of the South Bank area were designed in a style reminiscent of Egyptian temples and Renaissance towers. 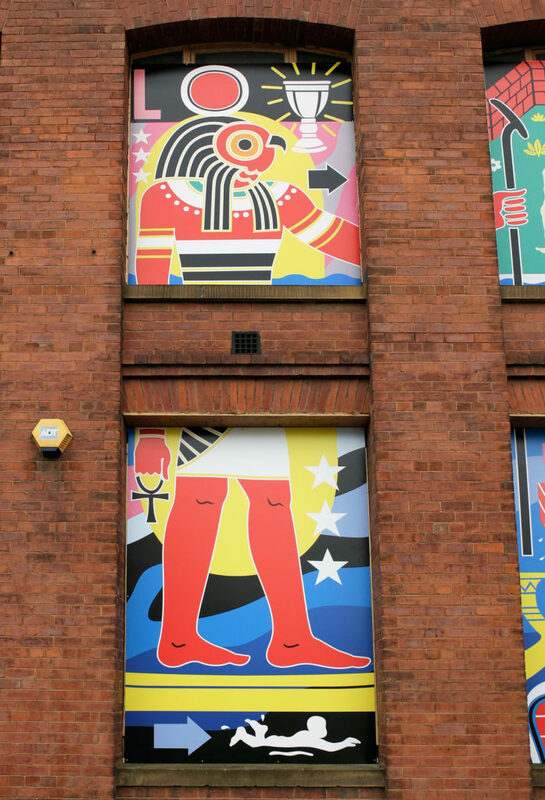 For this, he chose to create a comic-inspired series of Dibond window prints that serve as a fantastical juxtaposition to the harsh brick of the building’s exterior. 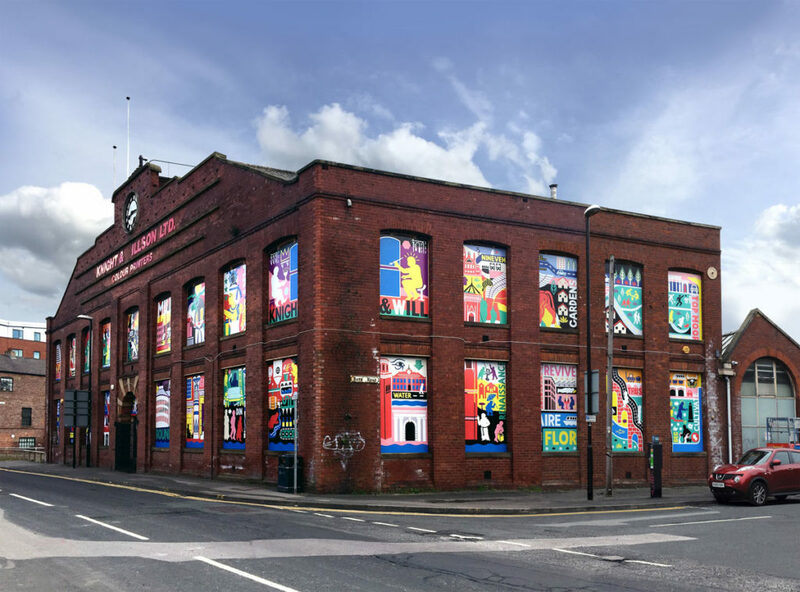 The colorful mural utilizes 32 Dibond aluminum composite prints that were digitally printed and installed by UK specialists, Dock Street Signs. An interesting challenge during installation was that the windows of the building were not uniform in size, typical of buildings constructed at that time. This required Dock Street Signs to trim the Dibond on-site. 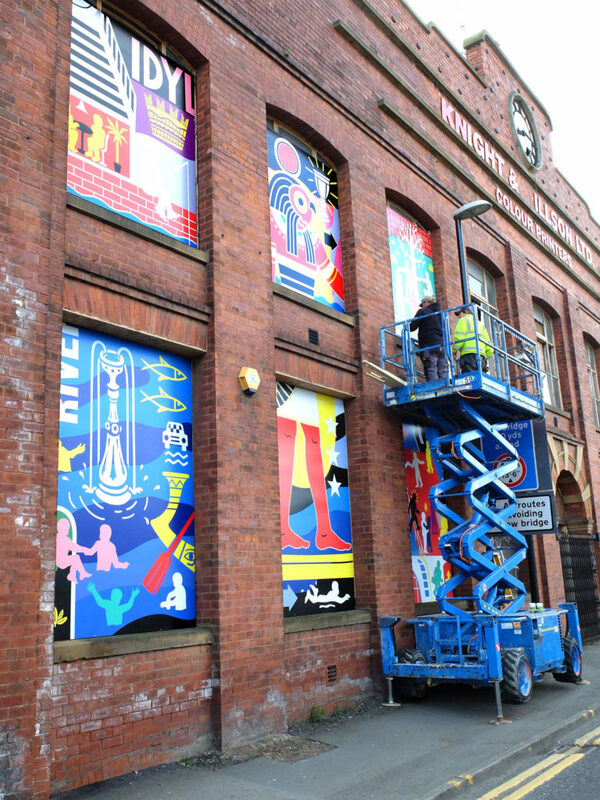 The installation is semi-permanent; it will remain in place until the building is used for new purposes. In his first large commission outside of the UK, Kirkpatrick is currently completing a large mural in Amsterdam, Amstel Tower. When finished the piece will be 30 feet long and 11 feet tall. To follow Kirkpatrick’s latest exhibition and to view his previous works visit iankirkpatrick.wordpress.com.